Beautiful Bella Thorne was photographed wearing Modern Vice last night in West Hollywood, CA. 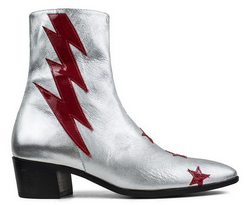 The actress rocked her Modern Vice Original Bolt Boots in Silver/Red ($398, www.modernvice.com). In addition to her super trendy bolt boots from Modern Vice, Bella is wearing fabulous ripped jeans. Did you know that Diane Guerroro also enjoys bolt boots?